Need some help buttoning your clothes or taking off your shoes? Check out our dressing aids. We Keep Your Socks Together! 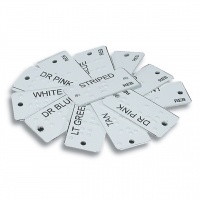 These brailled labels are perfect for stitching or pinning on to clothes so that they can later be identified by the blind wearer if item is a particular color or pattern. 100 white brailled with black print tags come in each package and can be re-used over and over. Tags measure 9/16 x 1-1/16 in. The Buttoneer Button Fastener easily reattaches buttons in seconds - without threading a needle or sewing - ideal for those with low vision or arthritis. Quick and easy to use. Simply load a fastener, hold, and push. Additional fasteners available. 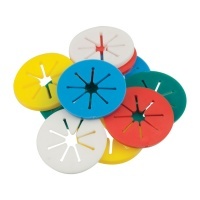 Buttoneer Fastener Refill Pack Item Number 802812. SockPro Sock Holders - Assorted Colors - This household accessory makes laundry time so much easier! Imagine, you will never have to worry about lost socks again! Sockpro Sock holders help keep socks together in the washer and dryer - no more sorting hassles. Put a stop to missing socks with this useful household accessory. Five colors available for easier identification; assign a different color to each person. Pack of 10 assorted colors. 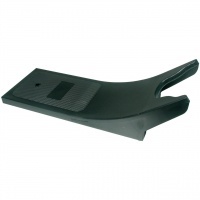 The Foot Socker is a simple, effective tool that helps you put your socks on more easily. Just place the form between your knees and slide the sock over the form until it's snug. The rigid plastic form holds the sock open while you insert your foot. Once your foot is in, pull the Foot Socker out and finish putting on your socks by hand. Designed to assist in the initial stages of putting on socks, it's a great dressing aid for those with arthritis and dexterity challenges. 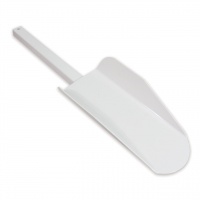 Made of sturdy white plastic. Measures approx.18 Long x 5.25 Wide x 2.5 Thick. Easy to use, Just sew them on. Shape indicates color. 8 colors per pkg. 1 button of each color. The Pocketdresser contains four primary dressing aids in one pocketknife style tool, making it the ultimate tool for dressing independence. The large buttonhook is easily capable of buttoning even new, thick, denim jeans. The closed-loop buttoner and small buttonhook are ideal for medium sized shirt buttons all the way down to delicate, collar shirt buttons. 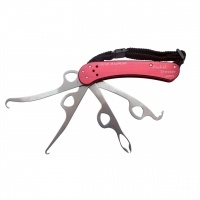 The zipper pick, the most specialized tool of the group, functions not only as a zipper pull, but also as a pick, to pry out buried zipper tabs and even undo knotted shoelaces. And since all tools can be positioned at any angle in relation to the handle, it is truly helpful for those with limited arm and wrist movement. The lightweight design along with the adjustable hand strap and pocket clip make this the ultimate dressing aid for those who wish to maintain their dressing independence. Weighs just 4.1 ounces. Measures 4 7/8 (closed). Color red. 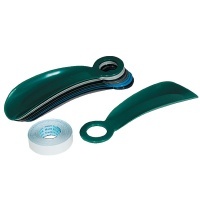 No more bending, reaching or straining when putting your shoes on! Shoe Dini: The Telescoping Shoe Horn is an extra long shoe horn that gives you the extra reach you need to put on your shoes more easily. Plus, it features a built-in clip that you can position on the back of your shoe to help take shoes off easily, too! It's great for those with neck, back or leg pain or injury, as well as anyone with flexibility, dexterity or mobility limitations. 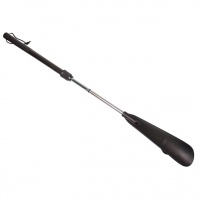 Telescoping handle extends to almost three feet. No more 'flat tires' (crushed backs of your shoes). Easy to assemble. Weight in Original Packaging: 6.7 oz. A Swedish classic. 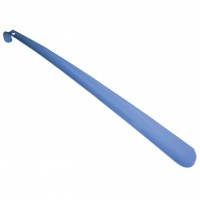 It's made of strong metal that won't bend or break. The form of the shoehorn cups the heel and guides it softlyinto the shoe.